The experience of noticing the dragonfly, and the sun above the clouds was beginner’s mind, seeing the world in wonder and joy as if for the first time. Beginner’s mind is the mind of a child, living with affection and curiosity about everything, from climbing stairs to insects. Over and over we’re reminded beauty is always right in front of us. We spend too many hours sleepwalking through Paradise. This entry was posted in Creativity, Mindfulness and tagged beauty, beginner mind, dragonfly, Paradise. Bookmark the permalink. 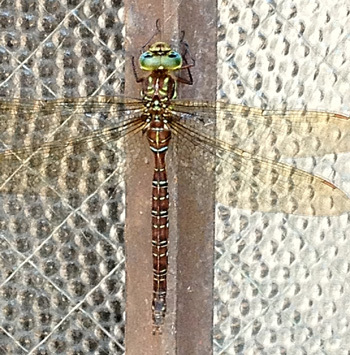 this wonderful post popped up on my linked in and followed it over because I love dragonflies. So lovely and everywhere if you open your eyes to them. Sleepwalking, one of my favorite topics. Most everyone is asleep. It’s easy to spot those who are awake, they’re excited about life, wanting to drink it all in, fired up to learn new things, eager to take in what surrounds them. I see folks in walking comas all around me, being obedient to the generic life blue print. That’s why the world seems so crazy most of the time, people are trapped in cocoons unable to break out. I cannot leave a comment linking to my muse WP site, only to another account. It’s happening more and more with blogs on WP.